All miter saws share some similar parts and functions, but a compound miter saw is capable of making two cuts at one time, a miter cut and a bevel cut. Every miter saw made has a saw table, which is what the wood to be cut rests on, a fence which is located at the back of the saw table and is perpendicular to it, and a saw head, which is the part that holds the motor and the saw blade. Miter cuts are made by placing the wood on the saw table and swiveling the head of the saw to one side or the other. The blade of the saw remains perpendicular to the saw table. All miter saws will cut to at least 45 degrees to the right and left, with some saws cutting as much as 60 degrees. Bevel cuts are made by rotating the head of the miter saw so that the blade of the saw is no longer perpendicular to the saw table. The blade of the saw remains perpendicular to the saw fence, however. Some saws bevel cut to only one side while others, known as double bevel miter saws, make bevel cuts to both the right and left sides. Compound miter cuts occur when a single cut is made that is both a miter cut and a bevel cut. That is to say that the saw head swivels to one side and rotates to one side as well. The blade of the saw is not perpendicular to the saw table or the saw fence while making this cut. Although the ability to slide doesn't affect whether or not a saw is a compound miter saw or not, it is worth noting as more and more of these models are produced each year. 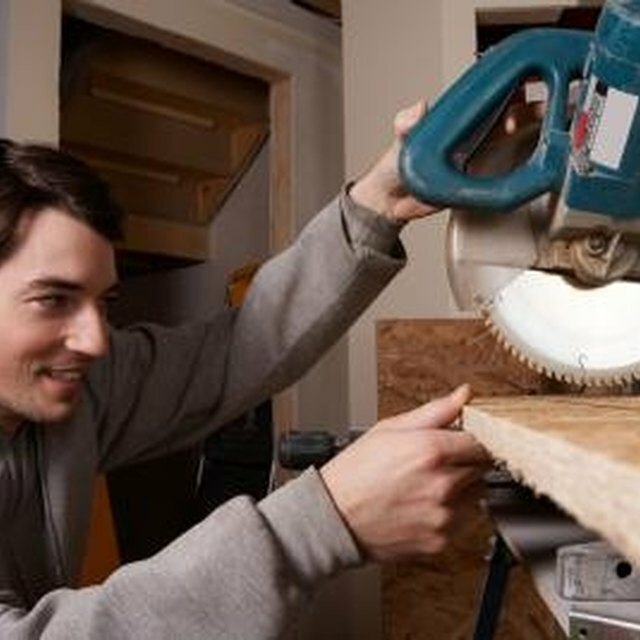 A sliding compound miter saw is one on which the saw head is mounted on two rails and and can slide forward, increasing the width of the cross cut. The largest sliding saws can cross cut a board that is roughly 14 inches, compared to a little more than 8 inches for most standard compound miter saws. To change miter angles, most saws will have a handle with some sort of locking mechanism that prevents the saw head from changing angles during cutting. The saws will also have detents at common angles. Detents are simply built-in stops that allow for precise and repeatable cuts at the most commonly used angles The same holds true for changing bevel angles, except that the bevel angle is changed at the rear of the saw for almost all saws made Once the miter and bevel angles are set, all that remains is to press the power trigger and cut the wood. What Is a Lever Bypass Meter Socket?